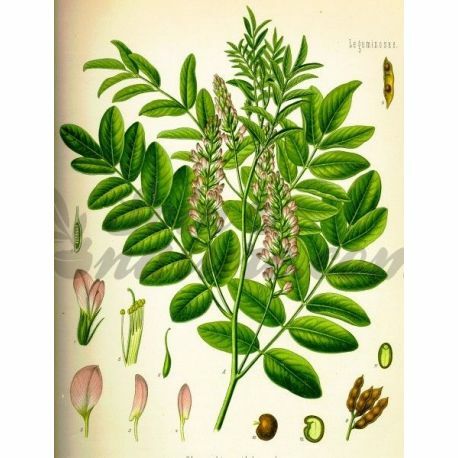 LIQUORICE ROOT raked IPHYM Herbalism Glycyrrhiza glabra L.
IPHYM Herbalism Glycyrrhiza glabra L.
Latin name: Glycyrrhiza glabra L.
The root raked licorice increases the secretion of gastric mucus and reduce that of pepsinogen. It is a gastric antiulcer which plays a preventive and curative role vis-a-vis of gastric ulcers and inhibits the adhesion of Helicobacter pylori to the gastric wall (polysaccharides). Flavonoids are antispasmodic (liquiritin and isoliquiritoside). This plant is expectorant and mucolytic, it facilitates expectoration. She's also antitussive. Glycyrrhizin has anti-bacterial, antiviral (glycyrrhetic acid is active against the SARS virus), anti-hepatotoxic, healing and immunostimulant; immunostimulant because it increases phagocytosis and stimulates the production of T and B lymphocytes are noted mineralocorticoid effects and potentiation of steroids (inhibition of 4.5 b reductase responsible for the inactivation of steroid hormones). The glycyrrhizic acid interferes with dehydrogenase 17 beta-hydroxysteroid, which catalyzes the conversion of androstenedione to testosterone, which lead to a reduction in testosterone levels in men as in women. Licorice is adaptogen. Stimulation of memory is noted by glabridin with an anticholinergic effect (potential effect in Alzheimer's disease. It is also a neuroprotective (glabridin and isoliquiritigenin), an anticonvulsant and an antidepressant. 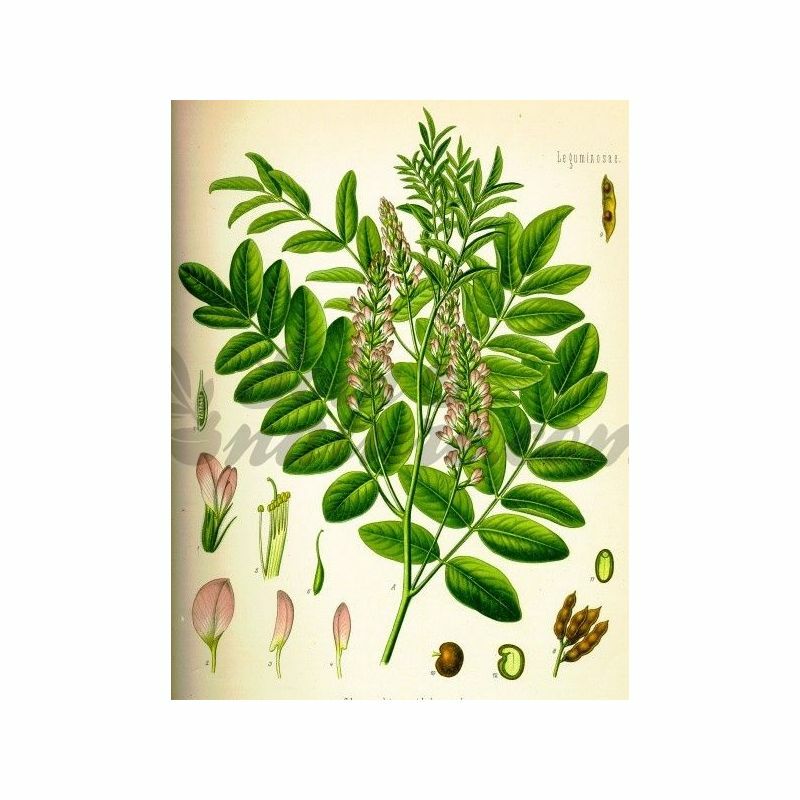 Licorice is antihistamine and that anti-inflammatory (glycyrrhizin) by inhibiting the production of prostaglandin E2 from macrophages. The glycyrrhetic acid stimulate natural conversion estrogen testosterone The glycyrrhizic acid interferes with 17ß-hydroxysteroid dehydrogenase, which catalyzes the conversion of androstenedione to testosterone. Antitumor activity was noted (prostate cancer) by licochalcone, anti-angiogenic, decreases the production of VEGF. 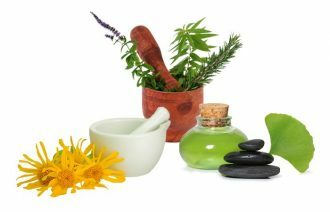 Moreover, it is hepatoprotective, a néphroprotectrice (glabridin) and a wound healing. There is a antibacterial activity vis-à-vis Staphylococcus aureus resistant to methicillin (MRSA) by flavonoids (the licoricidine restores the effects of oxacillin), and That a antifungal activity (glabridin). - Poisoning glycyrrhizin can cause pseudo primary aldosteronism.